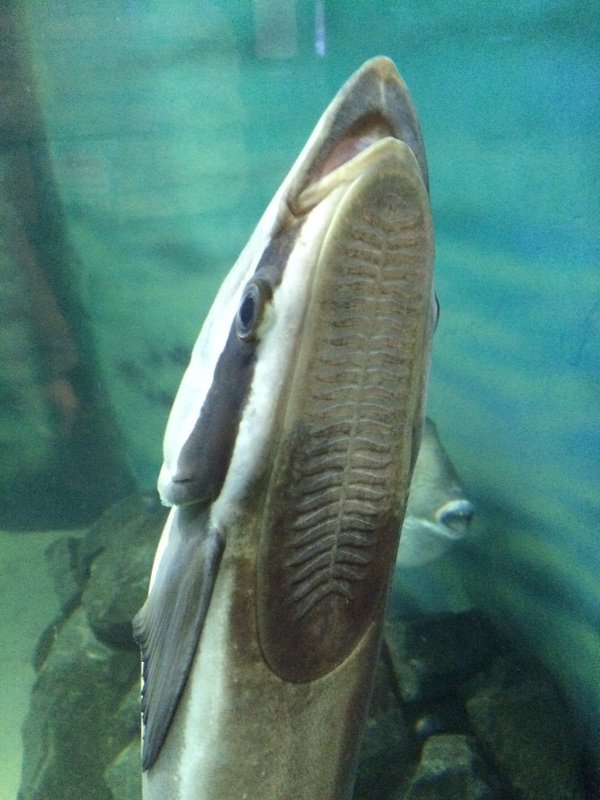 In January, while my BFF was in town, we visited Jenkinson's Aquarium in Point Pleasant, NJ. This aquarium is right on the beach and quite small, but offers a nice variety of wildlife. Jenks has a ton of local exhibits, showing all kinds of fish and creatures found in NJ. I haven't been to this aquarium in years and it was great to see the exhibits were well maintained and updated. There are a few of my favorite things, like frogs, sharks, etc... But this aquarium is sadly lacking in jellyfish. There are a few surprises, like these creepy looking nautiluses. Jenkinson's has good sized touch tank, seal shows, and a lot of fun activity days and nights. Behind the scenes tours, night visits, and "seal-abrations" are just some of the fun activities guests can join. But be warned, their website's is pretty hard to navigate. The staff is friendly and I'm sure calling will yield better results for actual information. In the Summer, Jenkinson's rules pretty much the whole Point Pleasant boardwalk, with amusements, restaurants, and arcades. But the aquarium is is still the jewel in my opinion. Some people think it's odd, but I'm a huge fan of zoos. Where ever I go, I try to see a zoo, aquarium, nature museum, bug exhibit, farm, petting zoo, etc... A visit is always in any trip I plan. Or several if there's time. I know many have mixed feelings on seeing animals caged, and I do as well. I try to focus on the conservational and educational aspects of these establishments. I can't help but be amazed and delighted by seeing strange, interesting, and exotic creatures. While we were in Tennessee in December 2013 we went to the Nashville Zoo at Grassmere. I never posted about it way back then, but I've been thinking about that trip recently and thought it was time to share. The Nashville Zoo is vastly different from our little zoo at home in Prospect Park. It sits on a huge piece of land with bamboo paths winding throughout. Most of the exhibits are outdoors. We went in the dead of Winter, so many of the animals were not on view. We even managed to go quite late in the day and miss some of the ones that were out. Even with our poor timing we got to see some great animals. The Nashville Zoo has both a white tiger and an orange one! These were incredible to see, but it was very clear that these great beasts are not supposed to be caged. This zoo had so many large and wild cats! Perfect for cat lovers like ourselves! Despite the cold, the animals were very active! We got to see many close up, only a few feet away. 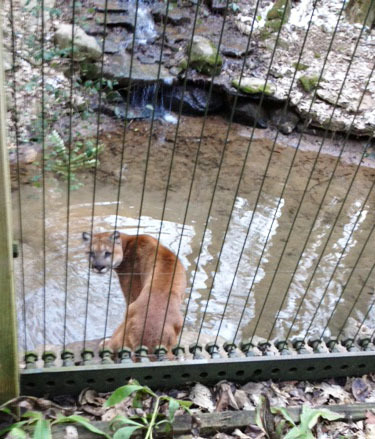 Like a cougar drinking from the "stream". This leopard seemed to be observing us as much as we were him. As everything we visited in Nashville on that trip, the Zoo was deserted. It was great!! We had the whole place to ourselves. With no one else checking out each habitat, the animals really seemed to take notice of us. But I also suspect they knew it was closing/feeding time. 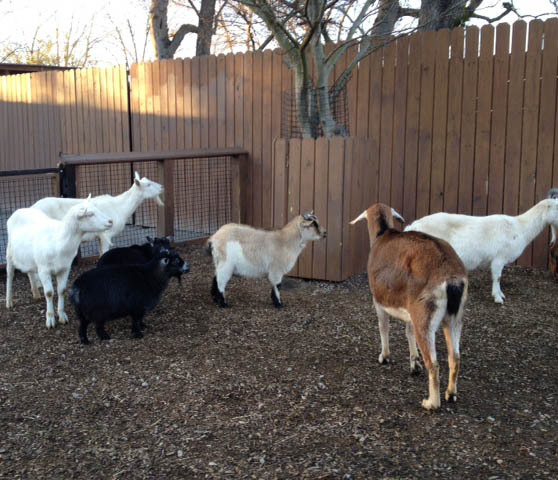 These goats were all lined up, waiting to go inside for the night. Overall, it was a wonderful trip, and I can't wait to go back in the Spring or Summer! It will be wonderful to see more animals, even if that means more people, too. We try to get to zoos pretty often so I hope to make my animal observations a semi regular post. I could write 10 posts about our local zoo alone! Do you have a favorite zoo or aquarium? Have you been to the Nashville Zoo? Care to comment?